The Kangaroo beta has been launched. It now has its own site ( kangaroophysics.com ) where you can download it for free and ask questions or join in the discussion. In April I went out to Arizona to attend COFES (the Conference on the Future of Engineering Software) where I had been invited to present Kangaroo as part of the Maieutic Parataxis session. A project I was involved in with BKK architects has been selected as part of the Australian exhibition at this year’s Venice Biennale, where the animated visions of future cities will be projected in stereoscopic 3D. I gave a presentation on Kangaroo at the Architectural Association alongside Jon Mirtschin (Geometry Gym), and David Rutten (creator of Grasshopper) who showed the very exciting Galapagos evolutionary solver. I was also a guest critic at the AA DRL jury. I recently joined Chelsea College of Art and Design as an associate lecturer on the Spatial Design course. I will be presenting at the upcoming Architecture et formes complexes conference in Paris and also teaching an advanced grasshopper workshop there. 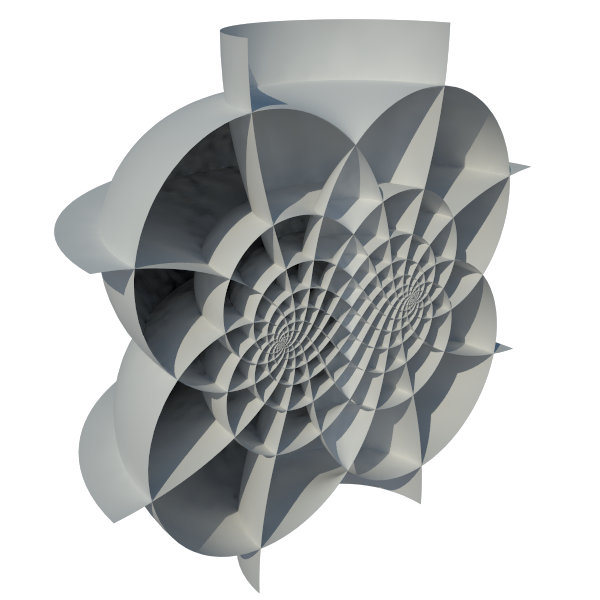 Along with Gregory Epps of Robofold I will be teaching a folding physics workshop in London (details to be announced shortly on the curved folding site). In July I will be teaching at the Biodynamic Structures workshop in San Francisco. Some curious smooth branched forms by Wieland Schmidt combining my Diffusion Limited Aggregation script with StructDrawRhino. Some paintings inspired by my 4D rotation animations. If you have created something using or inspired by anything I have shared on this site and would like to be featured here please let me know. Anyway, that’s enough with the updates for now, time to get back to this site’s intended purpose of exploring the themes of Space, Symmetry, and Structure. I will be posting again soon with some thoughts on quaternions, spatial rotation, orientation entanglement and triply orthogonal systems of surfaces. nice to see that you are getting around – I hope that a lot of people will see your very astonishing work. Hopefully you get something out of it as well! Never mind, there it goes, though jerkily. Hi Daniel… you’re welcome to link to the Space Planning tool I developed with Kangaroo. If you need the Vimeo link just let me know I’ll send it to you.